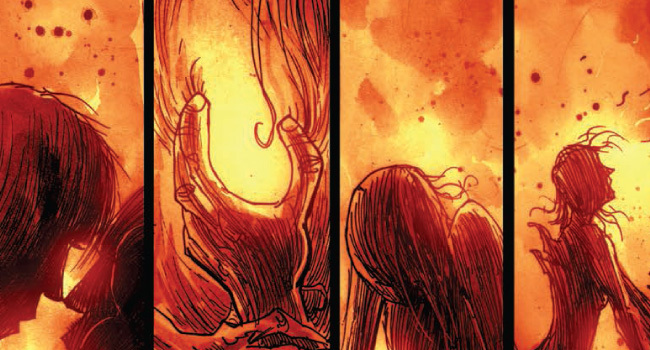 I’m going to start this off by saying Ben Templesmith is one of my favorite artists in comics right now. His style resonates really well with me and my wife — we have a Doctor Who print he did hanging in our front room. So now you all know I may geek out a bit in this review of his new book, The Squidder. IDW worked with 44Flood to put out the Templesmith original. And when I say ‘Templesmith original,’ I mean TEMPLESMITH. Seriously, this is directly from the book: “Ben Templesmith creator, executive producer, writer, artist, & letters (& whatever else he can think of).” Eventually, I’ll get over how talented Templesmith is and get on with an actual review. I had pretty high expectations going into this four-book series, seeing how I was already a fan of his, and I was very impressed with The Squidder. Templesmith crafts a fantastic story any sci-fi fan (or, actually, anyone) will be able to enjoy. You get a story full of action and depth. The title character has lived a life no one would envy. He lives in a world none of us would not enjoy and, without giving away too many spoilers, he’s lived through some things that would break anyone. His journey brings about some great internal changes and how he sees the world. The art is what first attracted me to Templesmith’s work, and The Squidder lives up to my expectations. Templesmith’s style is unique and refreshing. I viewed the books on my Kindle and can only imagine how much better they would have looked if I had them in my hands. Looks like there will be a collection of the 4 books early next year, and you can bet I’ll be picking it up right away. Reading the books on my Kindle worked well; I would recommend it to anyone who likes comics and reading. While I generally maintain there is no substitute for a hard copy in your hands the convenience and portability of digital copies is very nice. Not once did I have to worry about damaging my books as I carried them around. 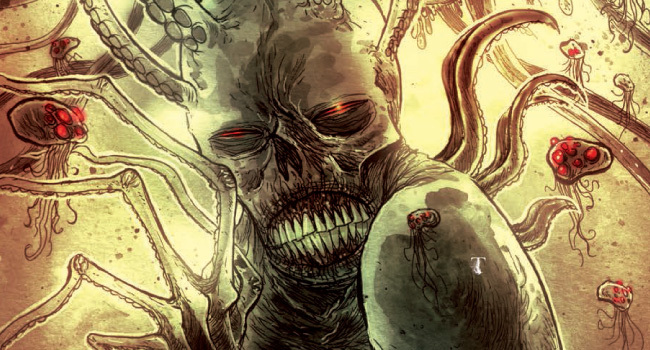 Even with high expectations, I would say Ben Templesmith blew me away with The Squidder. The incredible amount of work put into this book is very evident and very much appreciated. If you like comics, sci-fi, fantasy, or dystopian futures, this is definitely a series you should pick up — thank me later. The digital versions are $1.99 through the Kindle store, and you should keep an eye out for the collection early 2015.